With Alexa skills thrown into the mix, the UE Megablast transforms one of our favourite speakers into something more connected. It's a great performer, waterproof and robustly built, with software updates bringing essential feature updates. Just make sure you buy the charging base too. The UE Blast and Megablast step away from the Boom 2 and Megaboom to form a new family of Ultimate Ears speakers, but with a similar story to tell: it's all about loudess and portability. These are speakers that are designed to be used anywhere, any time. They also fully embrace recent changes in speaker land, as a result of Amazon. The Echo has turned the speaker market on its head, by adding voice control in the shape of Alexa, creating a new category of device. When Amazon announced that Alexa Voice Services were going to be available to third-party manufacturers, the announcement was rather quiet. The implementation, however, is rather loud. And few speakers are louder than the UE Megablast. Since launch, the Megablast and Blast have been updated to be even smarter. Alexa voice control is a key focal point of the Megablast. Amazon's smart assistant lives within, which is rather unusual for a connected speaker. The Echo Tap offered similar (but never launched in the UK, go figure), while the biggest rival Alexa-powered speaker we've seen, the Sonos One, is strictly a wired affair. Of all the Bluetooth speakers out there, Ultimate Ears always manages to acquit itself well. It's that combination of waterproofed convenience, a design that's tough so it's well suited to an active life, while also delivering great 360-degree sound, with plenty of volume and bass. None of that changes in the Megablast. It is big, bold, and very Boom-like, but it sticks to that cylindrical design with rubberised ends and a rubber strip down the side. Big, almost biblic volume controls sit on the side – that's the big "+" and "-" – and if you've seen a UE Boom speaker before, you'll know what it's all about. There are also two top buttons, the power central illuminated power which flashes when Alexa is being consulted and a smaller button you can press to turn on Bluetooth pairing. You can also mute the Megablast with a press of this smaller button and the volume down at the same time. It comes in a range of hilariously-named colours: Graphite (black), Blizzard (white), Blue Steel (blue, of course), Merlot (red), Mojito (green) and Lemonade (yellow). The Megablast is IP67 rated, meaning water- and dust-proofing, so it's a fine option to fill your pool house with tunes or to entertain on the rear deck of your yacht, without any worries if it gets thrown into the water, soaked in beer or just kicked across the floor by an enthusiastic reveller. If you just want to listen to Phil Collins in the shower, that's no problem either (in fact, it's recommended). That protection comes partly thanks to the Micro-USB port on the bottom being covered with a rubber stopper that's held in place by a screw-in plug with a D-ring that you could, potentially, use to secure the Megablast to your boat (or whatever). But seriously: What can Alexa do on the UE Megablast? The Megablast uses Alexa Voice Service to essentially mirror the experience that you get from Alexa on the Amazon Echo. It works in the same way – always listening for your voice – so you can just talk to the speaker and Alexa will respond. Alexa is a cloud-connected service, so the Megablast adds Wi-Fi to its connectivity to connect to a home network, giving Alexa access to all the skills it needs. No connection, no skills. The setup of the speaker starts with the UE app, but then shifts over to the Alexa app to complete the process, letting you sign in with your Amazon credentials. This UE app gives you some details, like the status of the speaker, and lets you control the Wi-Fi network to which it is connected. It's through the Alexa app that you'll assign skills to the Megablast, as well as manage the information and services that Alexa can access. This covers a huge range of things from smart home control – like setting your Nest heating to turning on your Hue lights – as well as being able to buy things from Amazon, track your Fitbit weight or set timers and alarms. If you're already an Alexa user, then the Megablast just picks up your existing Alexa profile and adopts all those skills and settings. It's probably easier to say what the Megablast doesn't do, rather than list everything that it does do (as Alexa's skill set is vast and growing weekly). Compared to the Amazon Echo (which offers the most comprehensive Alexa experience), the Megablast doesn't support Alexa calling or the Echo's multi-room grouping. Otherwise, the Alexa experience is very much the same. There is another minor point in the Alexa experience that Echo owners will notice. When you talk to Alexa on the Megablast, the music stops completely, whereas on the Echo devices, the music level dips and continues in the background. We feel that subtle difference makes for a slightly nicer interactive music experience on the Echo compared to the UE. The instant silence when you talk to Alexa using the Megablast feels a bit abrupt. We also get the sense that the microphones aren't as good on the Megablast as they are on the Echo (maybe that explains the music outage?). Although you can turn the Echo volume up enough so you have to shout at it to get a response, we get the sense that you hit that point sooner on the UE speaker - and you'll often have to shout at it. What about music: Does the Megablast support Spotify? Of course the biggest thing you're likely to do is ask the Megablast to play music. The UE Megablast will work seamlessly with Amazon Music, as the Echo does. If you're a Prime subscriber (but not a full-blown Amazon Music subscriber) then you get access to Prime Music, which also gives you some music. This will also include auto-rip music from albums you might have purchased from Amazon over the years and all Megablast buyers get a 3-month trial of Amazon Music. You'll also be able to use other services, like TuneIn, providing all the radio stations you can think of, just by saying "Alexa, play BBC Radio 4". The UE Megablast didn't support Spotify at launch, but thanks to a firmware update from the company it now does. That brings one of the most popular skills to this speaker, so you can play those Spotify playlists via Alexa. The update also brings in Spotify Connect, so you can control the speaker directly from the Spotify app - which if you're a Spotify fan, it a big deal. When we initially reviewed this speaker, the lack of native Spotify support was one of our criticisms: following the update, this is a more rounded and competitive offering. So good job UE! UE has also announced that a stereo mode is coming, allowing up to eight Blast or Megablast speakers can be connected for an even bigger sound experience, again, enhancing the offering. The biggest criticism of the Amazon Echo has always been the sound quality. That's something that's more pertinent now that we have the Echo 2 as a cheaper option, which sounds pretty cheap too. While the original Echo and the Echo Plus are ok, if you're a music fan and want more than kitchen radio performance, you'll likely be looking at something like the UE Blast or Megablast. When it comes to volume, Ultimate Ears says the Megablast is some 40 per cent louder than the Megaboom, which means it's seriously loud - 98dB to put a figure on it. As we've mentioned, that can come with some downsides, namely that when the volume is turned up higher than about seven, the microphone can no longer pick out your voice. But what you are getting at that volume level is fidelity that the Echo can't offer. The Echo noticeably drops in performance with increased distortion as the volume rises to higher levels, but the Megablast remains distortion-free at much higher levels. The sound profile does change at top volumes, however, with the mids and highs sounding a little shrill as the bass drops away, but it's still very listenable, very much filling the room with your music at neighbour-bothering levels. The Boom speakers from Ultimate Ears have always been known for delivering a meaty bass punch – and you get that from the Megablast too. There's depth and accuracy to this bass when you're listening at sociable levels, which is one of the joys of these speakers: they don't have to be too loud to be singing at optimum levels. Whether you're using the dumb Megaboom, Wonderboom or smart Megablast, the same still applies. Compared to the Amazon Echo, we can only say that it easily betters the sound quality in all dimensions. The smart speaker segment has been hotting up recently with more quality options from the likes of the Apple HomePod to Panasonic's GA10, but the unique proposition here is the portability thanks to battery power. Now the big thing that's different about the Megablast – setting it aside from devices like the Sonos One or Echo – is that it's battery powered, delivering 16 hours of listening from a single charge. That gives you portability that those others don't, so your Alexa experience isn't limited to the one room you happen to set it up in – you can cut the cord and embrace freedom. If you want to move it to your garage while you're servicing your Harley (with no need to worry about touching it with greasy hands), or if you want to send it into the den with the kids to get them out of the way, then it's perfectly suited to that. Ultimate Ears says that the Wi-Fi is good for about 330 feet and the Bluetooth for 150 feet, but this will very much depend on your surroundings. Within the house we experienced no problems at all, but we're using BT Whole Home WiFi, so would expect that. We also managed to walk a good way into the garden, about 100ft, before the Megablast started to lose connection and get a little patchy with music. For most, this will mean that taking music onto your patio or out into the garden is no problem at all. Of course, when on Wi-Fi you'll enjoy that full Alexa experience, but if you arrive at the beach with no Wi-Fi, it's Bluetooth you're likely to use. If you're desperate for Alexa when you're mobile then you can connect this speaker to a Wi-Fi hotspot on your phone. We've tested this and experienced no problems. At the same time, in the many hours that we've spent testing the UE Megablast, we've found it dropping off Wi-Fi more frequently then you might expect. For us this hasn't been such a problem that it's really disturbed listening, but it hasn't been as stable as the Amazon Echo that we normally use. For those looking to spend £269 on a speaker, however, we suspect that it will be destined for more regular use than just the great outdoors. That's where the Power Up base becomes really important. This is a charging plate that both the Blast and Megablast can sit on. It costs £35 and it's a real shame that you don't get one in the box, because it's this that means you can give your Megablast a home and then treat it like a normal connected smart speaker – just like the Echo. The only thing you have to do is change the bottom screw to a different type to allow the charging of the battery wirelessly, then it can just sit on the top of the Power Up all the time – and in reality, bending the rubber seal back to connect a Micro-USB cable to the Megablast is a bit of a faff, so this is £35 well spent, not just in terms of helping the Megablast realising its domestic potential, but in making your life easier too. If you don't have the Power Up base, the the Megablast will go into standby when it's not being used, like any normal Bluetooth speaker would. By default this is set to 15 minutes, so if you stop the music, wander off and then come back a little later, you'll be shouting at a speaker that's turned off. The same applies if you set a timer or an alarm – perhaps to remind you to take a cake out of the oven or so you get to that job interview on time. If your speaker is in standby, then no alarms. You can increase the auto-sleep time, including having the speaker never turn off, but then you'll be constantly charging it - making that Power Up base essential. You can sort of see what we're getting at here: if you're used to a home-based wired device like the Amazon Echo, and the full Alexa experience that goes with it, then you'll need to buy the Power Up base for the best experience that the Megablast can offer. And this position sort of undermines the experience, because it calls into doubt the practical union of these worlds: Alexa is predominantly a home experience and UE's speakers are best suited to a rougher life. However, while UE set the retail price at £269, we've seen it on Amazon UK for £169 (Amazon US), meaning you can snap it up with the Power Up base and have a much better experience than any of its rivals, at a much more competitive price. How does it compare to the Sonos One? We're not going to deny that we love the Sonos One. The thing that it has in common with the Megablast is that they both better the Amazon Echo devices in terms of sound quality, especially as things get louder (and we'd say that overall the sound quality between Sonos and UE is comparable). The Megablast is a bigger speaker overall and more expensive (but check out Amazon). Sonos is more contemporary in design, fitting in with existing Sonos speakers as well as being compatible with Sonos' wider system, so it can be grouped with other speakers for the normal Sonos experience. It also brings a huge amount of flexibility for music sources and even Alexa might struggle to give you all those options. Sonos lacks Bluetooth though, which the Megablast offers to cover all remaining bases. Sonos is strictly a home-based system and always needs to be plugged in, which is where the Megablast will appeal to a different type of user. While both will offer a similar Alexa experience, the UE gives you protection, portability and, ultimately, a great speaker you can take with you anywhere. You wait all year for a decent alternative to the Amazon Echo and then two arrive at once in the UE Blast and Megablast. 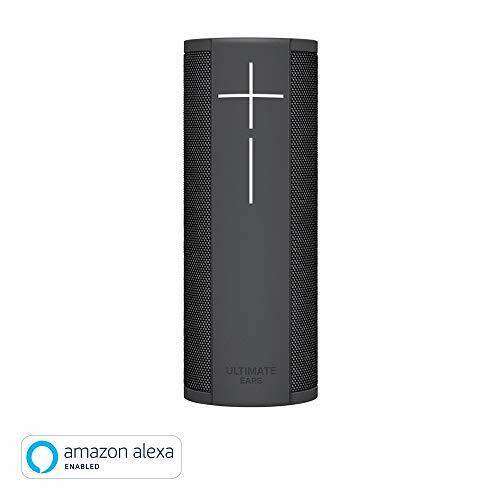 We were originally super-excited by the Megablast: it picks-up on one of our favourite speakers and gives it a modern twist to make it relevant in a connected sense with those Alexa voice-control skills. At the same time, the Megablast falls into a crack: as a rugged and waterproof speaker it's built to withstand abuse and be used on the move, but without Wi-Fi when out and about in the great outdoors you'll lose that Alexa connection and skillset. Furthermore, without the Power Up base being included in the box – which provides that always-on connection in the home, so Alexa doesn't fall on deaf ears – the Megablast becomes sort of niche straight out of the box. If you want a Bluetooth speaker that's solid in its delivery and offers a little more connectivity than UE's existing range, then we're happy to recommend the UE Megablast. It's saved by widely-available discounts, meaning you can get it and its Power Up base for the same price as quality rivals. If you're accident prone, crave volume or have a swimming pool at home, however, then the Megablast could be the ultimate portable speaker. And it sounds way better than any Amazon Echo product. The anticipated Sonos One added Alexa's skills to Sonos' already-connected music system. This speaker blends these two universes, giving you the benefit of the Sonos network music system - and working within that system if you're an existing Sonos owner - while also offering Alexa's skills on the flipside. That means you can add it to a Sonos multi-room setup for house-filling music or you can have it standalone, taking voice commands and controlling your smart home. Not only that, but it sounds good too. The Amazon Echo Plus can't match the UE Megablast for volume or music performance, but it is a better Alexa experience. While the Megablast loses out on Alexa calling and multi-room groups, the Echo Plus offers it all. It also offers native control of your smart home devices (for easier setup) while also coming in at a much cheaper price. If it's Alexa you crave more than portability and house party sound, then you might find the Echo Plus will suit you fine.